To combat the fake trends, a new trend has emerged-one that fights the facade with transparency and vulnerability. Instead of being filtered or super-spiritual, we're told to be real and honest. And rightly so. We should be getting real with each other about our junk. In Sick of Me, Whitney Capps shows us that spiritual growth means being both honest and holy-that we can come to Jesus just as we are, but we cannot stay that way. While virtues like vulnerability, honesty, and humility are desperately needed, we should fight for more. After all, the gospel is a change-agent. Whitney calls us beyond trendy transparency and into something better: true transformation. 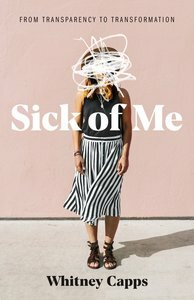 If you want to be honest about all your junk, but are also sick of staying there-Sick of Me is for you.